Musical actress Mona Leslie (Harlow) goes on stage thinking she’s performing for a charity event to find the whole house bought out by heir Bob Harrison (Tone). Mona falls in love with Bob as he is courting her, and her gambling agent Ned Riley (Powell) sits silently in the background, though he is also in love with Mona. After a drunken evening, Bob and Mona marry and they face the disapproval of Bob’s wealthy society family. -Dancer Betty Halsey doubled for Jean Harlow in the long shots. -Version of “Sing, Sinner, Sing” (1933) starring Leila Hyams and “Brief Moment” (1933) starring Carole Lombard. -“Reckless” was the first Jean Harlow film to lose money. 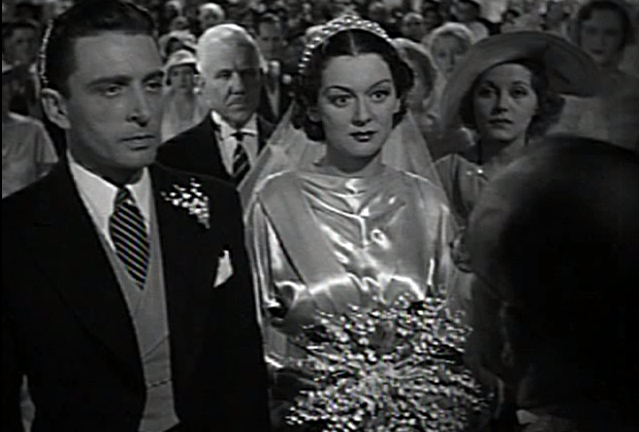 -A very young Leon Ames marrying Rosalind Russell. -“Trocadero” sung by Allan Jones and danced by Jean Harlow. I guess calling this a musical is a stretch. It’s really a melodrama with three or four songs and dances built into the plot, and none of the songs move the plot along. However, since it is categorized as a musical, the “That’s Entertainment” documentary features it and it’s Jean Harlow birthday, I decided to highlight the film today. 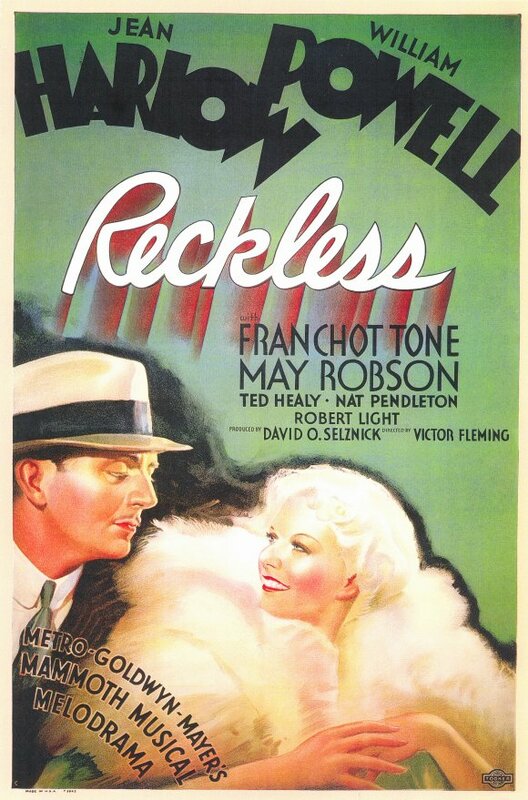 “Reckless” may be the first Jean Harlow film to lose money, but I don’t think it’s un-watchable. It’s interesting, it kept my attention, the plot keeps moving, but I will say it isn’t Jean Harlow’s best film. The film is interesting however, since it is shot around the time William Powell and Jean Harlow started their romance. You also see Rosalind Russell early in her career, though she is not the comedic Russell we are used to seeing. Early in her career, Russell is cast as the other woman or the forgiving, jilted friend- such as in “Evelyn Prentiss,” “China Seas” and “Man-Proof.” Certainly not the comedic lady we later came to know. Also keep your eyes peeled for a young, line-less and un-credited Leon Ames as he marries Russell. If you are looking for a musical with show stopping numbers, this isn’t it. But if you enjoy a good MGM melodrama with a few songs sprinkled in starring the original platinum blond, check it out. This entry was posted in Musical Monday and tagged Franchet Tone, Jean Harlow, Jean Harlow William Powell, Musical Monday, Reckless, William Powell by Jnpickens. Bookmark the permalink. I love that song ‘Reckless’. That’s a rare picture of Leon Ames and Rosalind Russell. I don’t think I have ever seen a young Leon Ames! I watched Reckless for the first time a couple years ago and I remember being really bored by it (unfortunately). I’m a fairly big Jean Harlow fan and I was expecting a lot more from this film. Maybe I should give it a re-watch soon and see if my opinion has changed at all. Great review!